Digital Surrogates from the PLATO User's Memos and Manuals, contain digitized booklets, manuals, reports and memos concerning TUTOR, the main language used to write instructional materials for the mainframe-oriented PLATO computer-based instructional system. 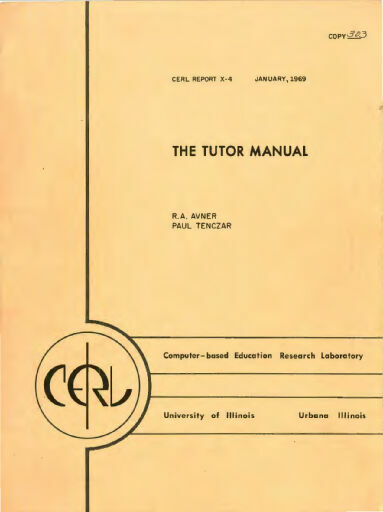 Digitized material include the series of published booklets "Plato User's Memo: Summary of TUTOR commands and systems variables" by Elaine Avner (1974-1984); the publication "Summary of the TUTOR language" by Elaine Avner (first edition 1984, second edition 1989); as well as manuals and reports about features and operation of the TUTOR language and other aspects of the PLATO system by Paul Tenczar, Richard. A. Avner, Jack Stifle, Elaine Avner and Gene Kelly. For additional information about PLATO computer-based instructional system see the Archives' record series on the Computer-based Education Research Laboratory. The PLATO User's Memos and Manuals (Digital Surrogates), 1969-1984, 1989, 1993 are managed by the University of Illinois Archives and do not feature precise descriptive information for each item. Discover their contents by browsing the folders and files. For more information, contact an archivist at illiarch@illinois.edu.